Location: From Kamloops travel west on the Trans Canada Highway (hwy #1) for 11.4 km. (7.1 miles). Turn south onto the Coquihalla Highway (hwy #5). Take exit 336 off hwy 5 and drive northeast a short distance on the Lac le Jeune road. Turn right at the Lac le Jeune sign post and follow for about 1.6 km. (1 mile) either to the provincial park or to the resort area. Approximately 35 km. (22 miles) from Kamloops. Resorts & Campsites: 2 resorts on the lake which offer full facilities and services including cabins, conference rooms, restaurants, exercise rooms, hot tubs, saunas and horseback riding. Lac le Jeune also has a large, beautiful provincial campsite with beach and swimming area, picnic area, over 100 campsites, running water, barbeques, showers and boat launching. Lac le Jeune offers a great all around family vacation and an excellent base camp from which to explore this magnificent Kamloops area.
. . . join BC Adventure member Gordon Honey for fly fishing action in the famous trout waters of Kamloops, B.C. Fishing Report: One of the practice lakes for the 1993 world fly fishing championship. 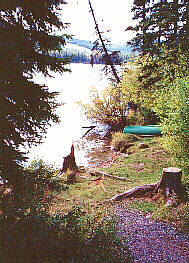 Lac le Jeune is a very popular family lake offering a good rainbow fishery, up to 3 lbs. Trolling and spinning gear are the most popular methods used here ,however, the numerous shoals around the lake harbour much insect life and fly fishers do very well especially in late June and early July when there is a good sedge hatch going on. Viewscape: Situated on the Nicola Plateau, part of the Interior Plateau physiographic region, Lac le Jeune is surrounded by hilly terrain forested mainly in lodgepole pine, douglas fir and engelmann spruce. Resorts are located at the southwest end of the lake. Many summer residences are found on the north shore along with a huge provincial campsite. Shoreline: Forested on the north and south sides to the lake. The west end is very shallow with lots of reeds and drains into a small lake with open meadows on it's north side. The east end is also very shallow with lots of reeds. Make ready your fly imitations because dragons and damsels love to emerge on reeds so trout will key on these areas. Ross-Moore and Fred - Ross-Moore and Fred are small lakes located about 5 km. (3 miles) to the east of Lac la Jeune and can be accessed by taking a rough dirt 4 x 4 road on the north side of Lac la Jeune . There is a small BCFS campsite with a cartop boat launch on Ross-Moore. Fishing can be excellent on both lakes with 4 to 5lb. rainbows taken regularly.